City of Derry player/coach Richard McCarter. 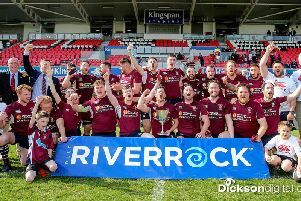 City of Derry coach Richard McCarter admits this weekend’s squad for the Ulster League Armagh will be selected with one eye on their upcoming AIL home clash with Barnhall in a few weeks time. McCarter wants to see the Judges Road men build on last weekend’s morale boosting win over Dungannon but said their main focus remains AIL survival. “We have a few injuries after the Dungannon game, so we are going to see later in the week what we are like but I would imagine it will be a fairly changed team, from what played against Dungannon,” said the Derry player-coach. “In saying that the Two’s have an important Towns’ Cup match on Saturday, so we don’t want to disrupt them too much. We’ll just have to see who’s available, who’s not, who needs a rest and who could do with a bit of game time. “Yes, we want to keep momentum going after a good win but at the same time the All Ireland is our main priority and the Barnhall game in a couple of weeks time at home, is massive for us. “So, yes, we want to go the game on Saturday at Armagh and keep the confidence high, but at the same time you just know deep down there’s not going to be the same intensity as there was last week and with a few changes, it might disrupt things slightly. McCarter did admit that their first victory of the season has given everyone in the squad a lift. “It has been a long time coming but after all the stresses and frustrates that we have been through for the last few months, it was a great feeling of relief to finally get that win,” he added. “It just has given us a bit of confidence now and we have got that monkey off our back. We can now really kick on and a couple of more wins will hopefully get us to safety, but we know it’s going to be tough and it’s not going to happen after one result.